Having beheld the Resurrection of Christ, let us worship the Holy Lord Jesus, the Only sinless One. We venerate Your Cross, O Christ, and Your Holy Resurrection we praise and glorify; for You are our God, we know no other; it is Your Name we invoke. Come, all you faithful, let us worship Christ's Holy Resurrection; for behold, through the Cross joy has come to all the world. Ever blessing the Lord, let us praise His Resurrection. For in enduring the Cross of us, He destroyed death by death. "It is about a new movement that has grown to a great extent in the last few years. Some types of people maintain that "we should return to our roots" and restore our "ancient national religion". They relate the worship of idols with our national identity, while using all the contemporary marketing means, promising solutions to all man's problems. Behind the loud proposals of neo-paganism and in general its complete theory-which calls on each country to return to worshipping its "traditional deities"-one can perceive very clearly, one more destructive tentacle of the "New Age". The national and traditional pretexts, pander to the consolidation of theosophy and occultism. We should beware therefore, and should examine seriously and with prudence every pleasant sounding proposal or malevolent and shallow accusation (mainly against Orthodoxy) perceiving and avoiding the humiliating cheerfulness. Let us not forget that these topics were already resolved by the spiritual greats." "The one who loves Christ thoroughly imitates Him as much as he can." 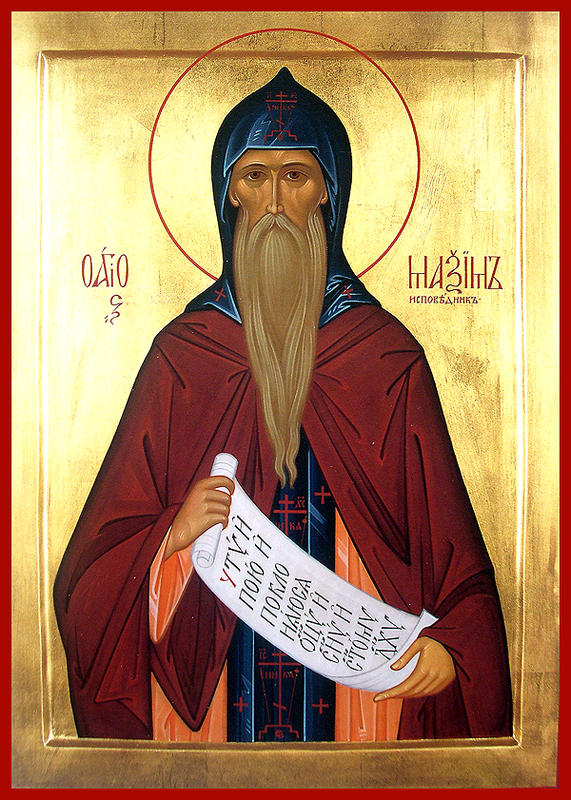 Saint Maximus the Confessor, whose feast day is celebrated every year on the 21st January by the Orthodox Church, has been acclaimed as one of the greatest thinkers in the whole of Christianity-indeed one of the most outstanding holy Fathers of the Undivided Church. He was born around 580 A.D. in Constantinople and was of noble background and because of that received excellent education. He was able to study philosophy, rhetoric, logic and grammar. It was in the earlier part of his life, while at the monastery in Chrysopolis that Saint Maximus wrote his first comprehensive expositions of the Christian life. These works are entitled: The Four-Hundred Chapters on Love and The Ascetical Life. According to these writings, as a result of the Fall, humanity, is described as having become entrapped in three fundamental evils from which all other passions flow: ignorance (agnoia), self-love (philautia) and tyranny (tyrnnis) or autonomy. Generally speaking, ignorance implies a failure to realize all that is truly good, seeking instead for gratification in the corruptive realm. Or to put it another way, ignorance, according to Saint Maximus to exclude God from all aspects of your life-that is, making plans without bringing God into the picture. Quite simply put in practical terms, for example, this could mean preparing for any sub-conscious rejection of God naturally leads to self-love, which is the root of all evils. Self-love arises from the many impulses mediated from the realm of the senses by the will, which cannot be overcome because the human person has forgotten God. Since God is ignored, everything is understood wrongly-that is, from the perspective of the self and not from God. For example, instead of eating simply to live, such people would choose to live in order to eat; instead of working in order to live, they would live their life in order to work. In forgetting God, such people inevitably misuse everything in the world since they have become the measure of all things, instead of God. Self-love radically changes our perception of the world. An example from our life today which could serve to illustrate what Saint Maximus meant is the following: instead of seeing, for example, the act of eating a meal together with other around a table as a pretext for communion, we see it purely as a means of survival. For this reason we often may choose to eat alone in front of the television since the act of eating has lost is sacred communal purpose. Such a misdirected perception colors all our activities in life. This gives rise to the misdirection of all those gifts or virtues bestowed upon all human persons which necessarily lead to: anger, despondency, gluttony, lust, avarice, vainglory, pride, dejection, rapacity (pleonexeia), resentfulness (mnesikakia), envy (fthonos) and slander (katalalia). Saint Maximus arranged his list of the Twelve Passions according to his Tripartite understanding of the soul-the concupisciple (sexual lust), irascible (anger) and rational. Indeed a life controlled by the vices, in their sum, cause, according to Saint Maximus a continual disintegration of the soul. Moreover they destroy the unity of the individual human person and they divide human persons from each and from God. Finally, all this leads, according to Saint Maximus, to tyranny since we become deluded into thinking that we are self-sufficient and do not need God or other human persons. Indeed others around may become, if not our enemy at least people in whom we are entirely disinterested. This state could be compared to the rich man in Jesus' parable of Lazarus, who passed by Lazarus every day and did not even think perhaps to give him some food or water. This was most probably not because he hated Lazarus but because he was so self-centered that he could not see beyond himself to the needs of those around him. Indeed, the self-sufficient person is one who falsely thinks that he/she can lead a life of self-seeking pleasure rather than love. However created in the image and likeness of God, human persons are called to reflect the life of God Who is love (cf. 1 John 4:8). Just like choosing to breathe in carbon dioxide for example, instead of oxygen, leads to our biological death, so too choosing an egocentric life instead of a life of love inevitably leads to our spiritual death. If God is taken out of the picture, we may be able to survive but we do not truly live a life in all of its abundance, a loving life ultimately free from death itself. This false sense of autonomy leads to our entrapment and tyranny to the passions. As an antidote to all this the Christian life, according to Saint Maximus has to do with redirecting or reintegrating our disintegrated mode of existence. Whereas the passions or vices have scattered our mind, the Christian life involves a cleansing process, a death and resurrection in Christ, the practice of the virtues (praxis) so that we can be led back into contemplation (theoria) of the mystery of God. It is only in overcoming the passions and leading a contemplative life that God can bestow upon us His gracious gift of divine life which is deification or theosis. Saint Maximust described this entire process in terms of being (einai), well-being (eu-einai) and eternal-being (aei-einai). Whereas the practice of the virtues leads to our being in God, a contemplative life brings us to a state of well-being in beholding God. And finally the last state of eternal-being has an eschatological and mystical character which will be bestowed upon the faithful in the age to come. What is all important in the practice of the Christian life; however, according to Saint Maximus is the virtue of love and it is to this all-important virtue that we now briefly turn. "The one who loves God cannot help but love also every human being as himself even though he may be displeased by the passions of those who are not yet purified. However, when he sees their conversion an amendment, he rejoices with an unbounded and unspeakable joy." "The one who does not love his neighbor is not...able to love the Lord."